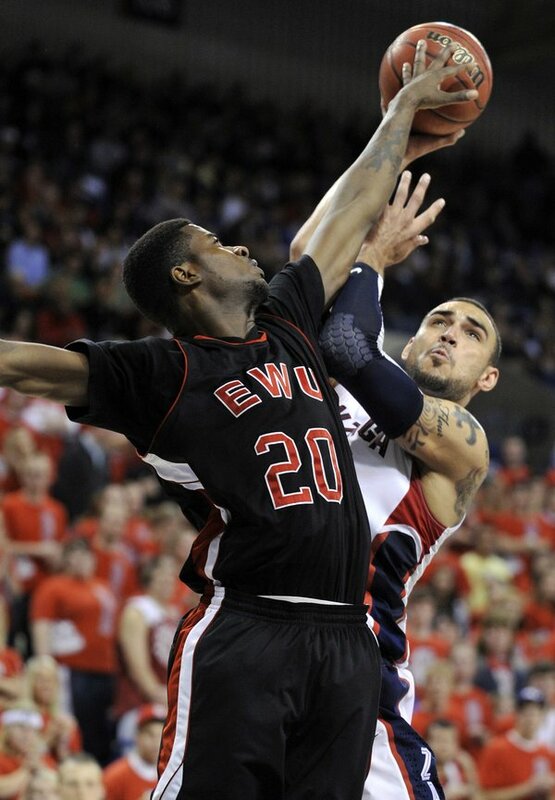 In Jim Hayford's first season for Eastern Washington, they will be deep at guard, even with the transfer of Glen Dean. A lot of guys got valuable experience last season, and they should be the strength of the team. This, if EWU is going to be successful this year, the onus will fall onto the frontcourt to produce. They have some experience there also. We know Laron Griffin is one of the best rebounders in the Conference, after getting 6.8 per game in about 23 minutes a game last season. Cliff Ederaine is solid also, averaging 8.5 PPG and 7.4 RPG, also proving to be an excellent rebounder. So they know what they have in those guys. It seems to me that the wildcard is Tremayne Johnson, who had a solid season in his first season in Cheney, but has the ability to improve. For starters, he was not a very efficient scorer last season. He shot 46.6% from 2 point range, and 29.7% from downtown (on 64 attempts). He was a 76% FT shooter, which suggests he could become more efficient FG shooting. And perhaps take even less threes, as it was not effective for him last season. He is also good at drawing fouls (4.9/40), which is especially effective with his excellent FT shooting. He should look to get to the hole and to the line more often this season. He was a good rebounder (8.0 OR%, 17.8 DR%), but his athleticism suggests he could improve a bit there. He had a 5.4% Block Rate last season, which was 4th in the Big Sky, so he will have a chance to lead the Conference in blocks if he can get enough minutes. That athleticism also suggests he can be a more efficient offensive player. One thing that will be key is what type of offense Hayford runs. Last season, even though they were small, they had a pretty slow pace (246th in the NCAA). Johnson seems to have the skillset that would thrive in the open court, which seems to make sense with this guard-oriented roster, so it will be interesting to see Hayford's philosophy. Eastern Washington has a chance to be very solid this year, thanks to a solid backcourt and the addition of Collin Chiverton. The key will be the frontcourt, and the wildcard there is Tremayne Johnson. He has the potential to be an excellent player for the Eagles, and how well he fulfills that promise could determine how high EWU climbs in the Big Sky. What are all of your thoughts? EWU has a good chance of finishing in the 3-4 range in the Big Sky this season. Lots of excitement about the new coaching hire and some of the new players, but they will have to get the wins to back up that hype. I see them having a pretty rough opening to the season, opening at cross-town rival #23 Gonzaga, but ultimately this will make them better come conference play. EWU could be a dark horse this year, but at a minimum I think they will at least make the conference tournament this season.